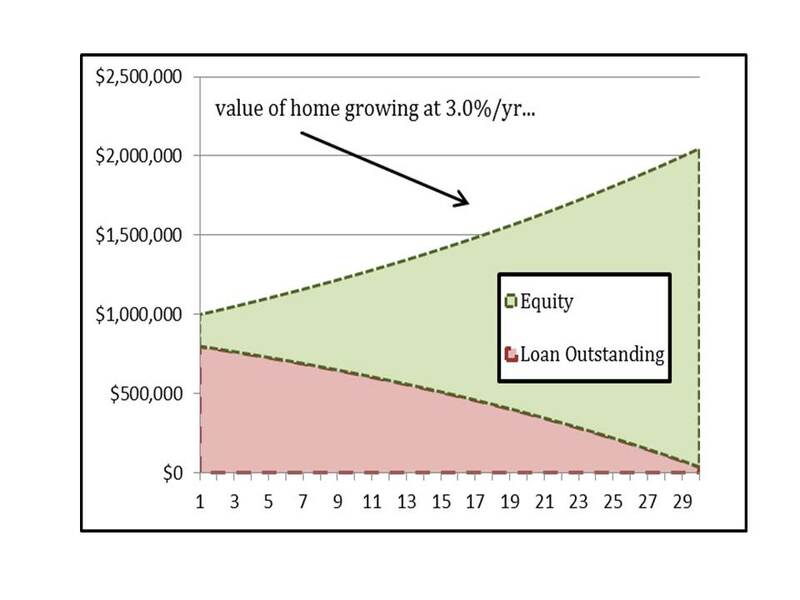 Buying a one-million dollar home; putting 20% down; financing with a thirty-year mortgage at 4.25%. The key assumption here (debatably the biggest assumption of all) is that the value of a home will grow at 3%/yr…in my estimation this is a modest, even pessimistic assumption – particularly in San Francisco given the supply constraints coupled with persistent demand. Finally, maintenance and taxes are ignored here because we would like to begin and end this conversation as a generalist. 1. Timing: The Loan-to-Value (LTV) decreases at an increasing rate as time passes—where the magnification of leverage comes from. When the home appreciates relative to the amount, the percentage of debt outstanding is crucial…timing is very important in real estate. 2. Mathematics: It takes fifteen years to pay half of the paper off. 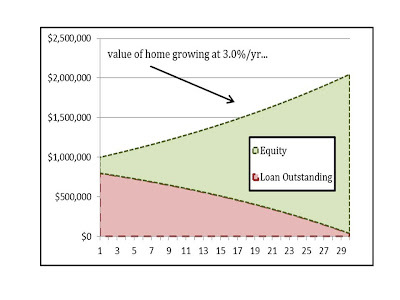 But at only 3% per year home appreciation, in year ten (five years sooner) you will already be a 50% equity owner.